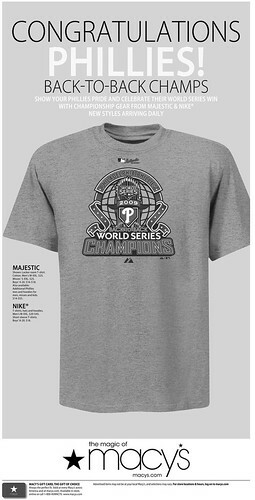 Some make-goods are in store for Macy's, after the Philadelphia Inquirer yesterday ran a premature ad by the department store congratulating the Phillies on winning back-to-back World Series. This, despite, being down 3-1 in the series (3-2 after last night). The Inquirer apologized late yesterday for the mishap.